Casa Del Mar by K. Hovnanian® Homes is a gated enclave of new townhomes in beautiful Boynton Beach. “Emerging Mangrove” speaks to the name of the community and is inspired by its location along the Intracoastal Waterway. Like the meaning of Casa Del Mar, mangroves on our shoreline are also a very important ‘house of the sea’. 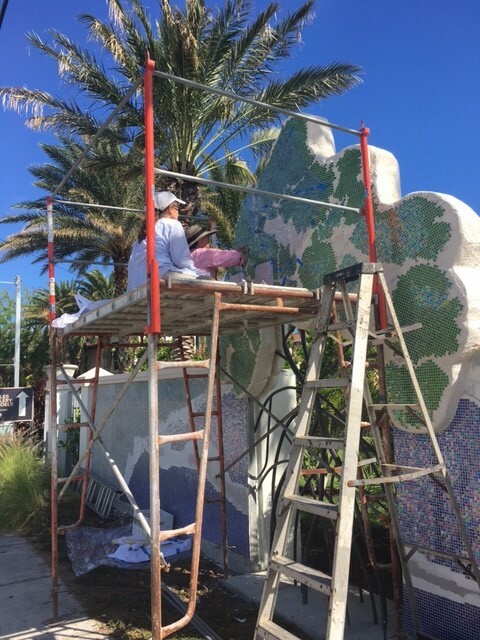 Casa Del Mar, a gated enclave of three-story luxury townhomes in Boynton Beach by K. Hovnanian® Homes, will unveil its new mosaic tile mural entitled “Emerging Mangrove” by Artist Lucy Keshavarz on Wednesday, January 17th, 5:00 pm with a reception to follow in the new Sales Center located at 2626 North Federal Highway, Suite 1, Boynton Beach, FL 33435, until 7pm. City of Boynton Beach Mayor will be in attendance along with other city officials. Everyone is invited to attend. Keshavarz, owner of Art & Culture Group, Inc. in Palm Beach Gardens, used the classic materials of metal, stone (cast) and custom tiles in a stylized format to create the highly recognizable red mangrove or “walking” mangrove. 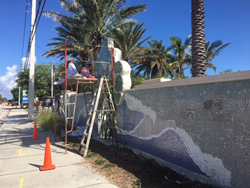 The sculpture is integrated into the community’s entry wall along US1, and appears to be emerging from the wall atop its or-derly mangle of branching prop roots, making the leaves and water glitter in the sun and the waves swirl with the tides. Following the reception, guests are invited to tour the Casa Del Mar community. Casa Del Mar boasts both solitude and peace-of-mind, making this intimate waterfront enclave the ideal place to call home. You will feel like you are in paradise everyday as you enjoy the amazing sights and surroundings of the Intracoastal Waterway centrally located to Palm Beach. You could also enjoy the nightlife, fine dining, music, art and cultural events in downtown Delray Beach off Atlantic Avenue, which is just minutes away. Nestled in Palm Beach County, Casa Del Mar is easily accessible to the Boynton Beach Inlet, which features some of the most beautiful coral and artificial reefs of the Palm Beaches. Boynton Beach highlights waterfront dining, abundant shopping and lively entertainment in the coastal heart of Palm Beach County. The Intracoastal offers an abundance of year-round water activities and the nearby Gulf Stream brings cooling summer breezes and warm winter sunshine to Casa Del Mar. Casa Del Mar offers 69 new, three-story townhomes with up to 2,257 sq. ft. of living space (per base plan). Homeowners will also take advantage of future community amenities that include a resort-style pool, cabana and boat dock. Townhomes at Casa Del Mar are priced from the mid $400s, which is subject to change. The sales center, located at 2626 N Federal Highway, Suite 1 in Boynton Beach, is open Tuesday through Saturday from 10am to 6pm and Sunday to Monday from 12pm to 6pm. To learn more about Casa Del Mar, visit khov.com/CasaDelMar or call 561-693-0921. Hovnanian Enterprises, Inc., founded in 1959 by Kevork S. Hovnanian, is headquartered in Red Bank, New Jersey. The Company is one of the nation’s largest homebuilders with operations in Arizona, California, Delaware, Florida, Georgia, Illinois, Maryland, New Jersey, Ohio, Pennsylvania, South Carolina, Texas, Virginia, Washington, D.C. and West Virginia. The Company’s homes are marketed and sold under the trade name K. Hovnanian® Homes, Brighton Homes® and Parkwood Builders. As the developer of K. Hovnanian’s® Four Seasons communities, the Company is also one of the nation’s largest builders of ac-tive lifestyle communities. Additional information on Hovnanian Enterprises, Inc., including a summary investment profile and the Company’s 2016 annual report, can be accessed through the “Investor Re-lations” section of the Hovnanian Enterprises’ website at http://www.khov.com. To be added to Hovnanian’s investor e-mail list, please send an e-mail to IR@khov.com or sign up at http://www.khov.com.